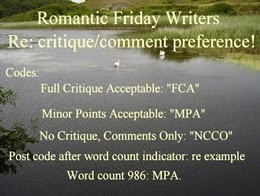 It is time for the first RomanticFridayWriters challenge of 2013. 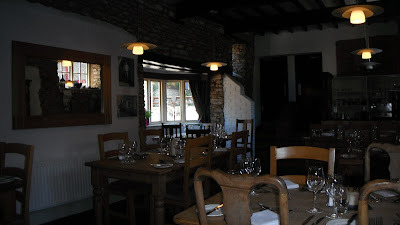 The theme this month is "out with the old, in with the new". We have 1,000 words or less to show intent, not outcome. ‘Andrew! Long time no see, old chap,’ he replied clasping Andrew’s hand and his elbow. Andrew and Ellen in one and Tommy in another to destinations far less crowded. Returned with a loving smile and a gesture to sit, eat toast and drink tea from her mug. Then she noticed the two empty chairs and her uncle’s and Andrew’s absence. They’ll be back shortly so be prepared for some teasing about Tommy and you. ‘I think he liked me,’ she replied with a twinkle in her eye. She scanned the pages in her leather bound diary absently patting her hairstyle. She could feel her pulse race and her blood quicken with a satisfying sensation. He wanted to know all about her, what she did and why she lived with her cousin Andy. ‘Then I find you by accident and have to wait a month with patience and silence. ‘What company do you work for,’ she asked as she raised her glass watching him carefully. ‘Actually it’s a government body covered by the Official Secrets Act,’ he admitted throatily. ‘No problem then,’ she said promptly, picking up the dessert menu nonchalantly. Ellen thought and decided she would trust this lovely man and what will be, will be. Such a lovely story, this one I really didn't want to end because all the way through, and I know it's probably only me, but I felt that Tommy and Andrew were more than .... friends? I hope for Ellen's sake that I'm wrong, she is really taken by him, but there's a secret? Or, you tell me -- am I way way off? Intriguing... I'm thinking there's a whole lot more to all three characters! "The Official Secrets Act" now that is intriguing. What girl wouldn't fall for the secret agent? I love the flow of this Sally. A couple missing words here and there, but the story kept me reading on. I think I even flushed when he was telling her he waited all his life for her. You really set up the romance nicely. And the mystery of his work, adds a bit of impending tension to the relationship. Excellently written. Thanks for the bit of intrigue to get my morning started. And thank you for participating in RFW this month. I hope your schedule settles down a bit. Hello Sally. Yes, this is intriguing all right. What secrets did Andrew and Tommy share? Wartime, post wartime. Loved the set up and the way you move through events chronologically. Tommy was well crafted, just the right amount of mystery. Not sure what the 'don't be angry with me...' is about--because he's a spy? Anyhow, you have a whole story here worth telling--perhaps we'll hear more of them. Like the others commented, I enjoyed the intrigue as well. Thanks for the terrific poetic elements as well. Very romantic but I want to know more about these characters and the intrigue. I love this story/poem! Your writing is superb. You build up the setting - a New Year's party - and show us these intriguing characters. So romantic! So mysterious! And a little dangerous! Please say that there is more to this story!? Are you inspired by real people or have you just dipped into this time period and pulled out these people because they seem to fit the time and place? Well done! Great characterization! Wonderful setting! So much is implied rather than said outright. Thank you for visiting my story about a romance made in Heaven. 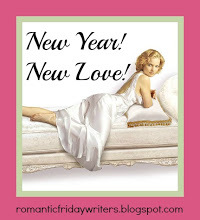 Actually, I came up with the manuscript title, Shyness is a Burden before I wrote the story for RFW. The title of Nils Frej's novel, came to me when I was thinking about something that my father had told me toward the end of his life; about being bashful. He was a very shy man who found happiness in his family. But I think about the many shy men and women who never marry the right people or get ahead in their careers because they were basically afraid of taking the necessary steps. Remembering some of your other beautiful stories that you have written for RFW, I think you may understand what I mean. Nils Frej has not written his novel. If it is to be written, I am the one to do it. All I know is that it is a sad story about isolation and overcoming fear. I've not seen a romance written this way, I liked it. And I agree with the others who have said, when is part 2? Very nice flow to the poem, I liked it a lot. But you leave us with a lot of questions! I hope Tommy's intentions are good... and is the Official Secrets Act a cover story?? Very intriguing, Sally! Elegantly narrative style, the characters held my interest right from the start, why did she live with her cousin Andy? Liked that you leave the reader to speculate on this and many more issues. Well done.